Sand Dollar, Woodstock Seashore Chimes. A beautiful chime with a hand-painted windcatcher that looks like the real thing! Nothing is more relaxing than a walk on the beach. And how many times have you picked up a sand dollar, thinking you'd make something out of them? No need - we've done it for you! 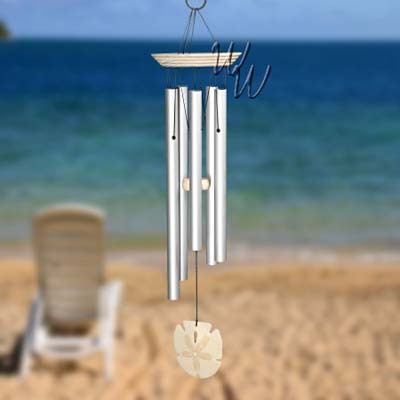 This chime will remind you of all the wonderful times you've had at the shore. Woodstock Chimes tubes are made of anodized aluminum that will not rust when exposed to the elements. However, over time, the aluminum may show pitting as a result of environmental factors. Please note this will not affect the beautiful tones of your chimes. If necessary, use mild soap and water (or a foaming, non-abrasive cleanser) to clean the tubes. You can also use very fine #00 steel wool to polish and restore your aluminum tubes.